Congratulations to Aaron Johnson for winning Season XIV Player of the Year honors. Johnson finished the season with four cashes. That includes a win and two other final table appearances. For his efforts, he'll receive a package that includes $10,000 worth of Main Event buy-ins next year along with hotel accommodations at up to six Season XV stops. All players who cash in an HPT Main Event are ranked for Player of the Year points. Join the ranks of HPT’s elite. Greg “Fossilman” Raymer, Ari Engel, Shawn Roberts, Aaron Massey and Allen "Chainsaw" Kessler have all held HPT POY honors previously. The title comes with more than bragging rights. Our POY earns a $10,000 package to use next season as well as complimentary hotel accommodations at those six stops. In case of a tie, all winning players will split the POY prize package evenly. 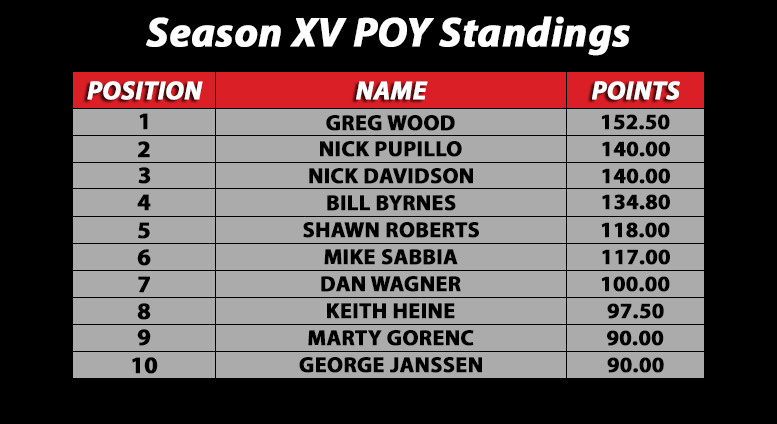 Click below to view the final Season XV standings. Take a look at full results from recent past season's Player of the Year races. Please note that players must cash to earn points.